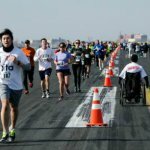 Fraport Greece “opens” the 14 airports for the first time by inviting athletes from all over Greece and the residents of these regions to participate in unique road races that will take place exclusively inside the airports. on Sunday, November 5, 2017, the “starting point” will be at Kavala International Airport “Alexander the Great”, , where the race Fraport Greece-Kavala Airport Run will take place. 10 km, 5 km and 1 km races for children will be included to the programme of the event. All the runners will simultaneously contribute to an important social effort as all revenue will be given to support the “oloi mazi mporoume ” program. Mr Alexaner Zinell, the CEO of Fraport in Greece, has mentioned : ” The Kavala Airport Run is a unique experience for all participants!An opportunity to exercise and do good in a unique place and environment. We invite everyone to embrace our initiative by joining us in this effort to support the very important work of “Oloi Mazi Mporoume”.